Since the new limited edition i7-8086K CPU is not soldered, overclockers immediately subjected it to some liquid nitrogen craziness. Der8aer conducted a live overclocking session at the G.Skill Computex booth and managed to get all cores running stably at 7.24 GHz and 1.48V. The overclocker gradually pushed the clocks, while the liquid nitrogen kept the chip at -185 degrees Centigrade. Intel officially launched the 40th Anniversary i7-8086K CPU a few days ago at Computex, even though the specs and performance stats were leaked almost two months in advance. The i7-8086K will start shipping today in limited quantities for US$429 and it is indeed faster than the i7-8700K, but Intel also revealed that the new chip comes in binned dies that are very easy to delid, so overclockers immediately took the chip for a spin and managed to bump the clocks to over 7 GHz using liquid nitrogen cooling. 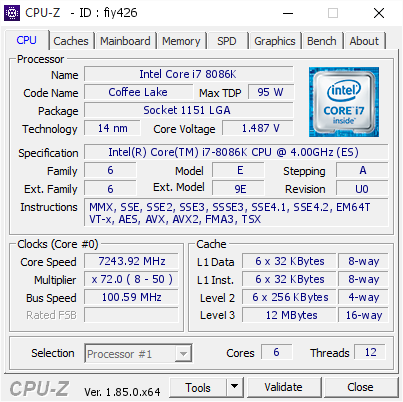 With the default clock set at 4 GHz and the boost clock going up to 5 GHz per single core, the six-core i7-8086K CPU is still limited to 4.4 GHz boost per all cores since it has a 95 W TDP rating. All cores may be safely overclocked to 5 GHz with proper air or water cooling, but serious overclockers always use liquid nitrogen to break all limits and get the highest clocks possible. 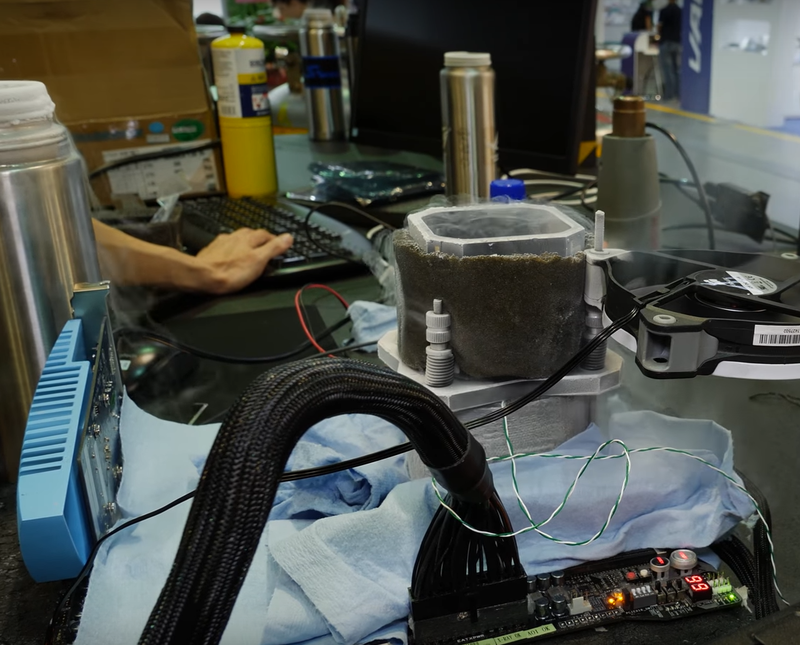 Working at the Computex G.Skill booth, overclocker Der8aer recently demonstrated how easy it is to delid the i7-8086K the CPU and then did a live overclocking session, pushing the CPU to a staggering 7.24 GHz clock for all cores. 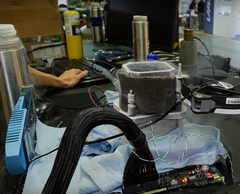 The liquid nitrogen cooler kept the chip at -185 degrees Centigrade, while the overclocking team gradually pushed the CPU until it hit 7.24 GHz and voltage was maintained at 1.48 V. The current world record for highest clocked six-core CPU is held by SPLAVE who managed to overclock the i7-8700K up to 7.4 GHz, but Der8aer did note that he only used the settings that previously worked well for the i7-8700K, which means further fiddling could yield increased clocks for the i7-8086K. While these extreme overclocking techniques certainly are out of reach even for enthusiasts, the 5 GHz overclocking per all cores is still a significant performance bump that can be achieved rather easily.